When it comes to advertising Microsoft leaves no stone unturned. 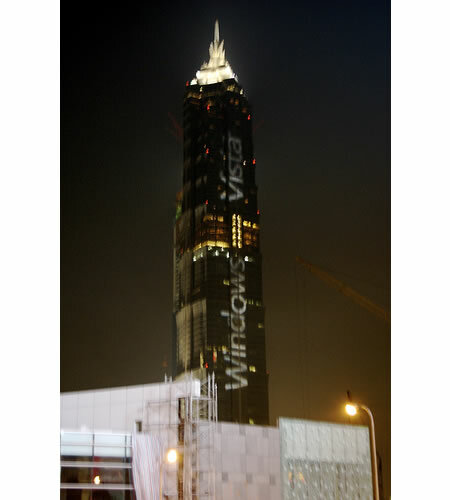 The Redmond giant threw up a huge ad for Windows Vista on the 421 meter high Jin Mao tower in Shanghai China one of the tallest buildings in Asia. However it makes me wonder why spend so much money advertising in a country where you can buy a copy of Vista for $ 1.00 only. Photo taken by Shanghai blogger Jakob Montrasio. Because Blogs like this spread the message? Why for pay for Vista at all? >>Because Blogs like this spread the message?